Performance Apparel represents a growing and lucrative segment of the garment decoration market. As Jimmy Lamb commented in our What do I charge webinar, selling performance apparel can be key to increasing the profitability of your business. How? Perceived Value. Decorated “T-shirts” sell in department stores for about ten dollars each on average. Performance Apparel commands twice that and more. Selling custom decorated performance apparel will naturally command a higher price and insulate you from competition from other decorators –and department stores– selling cotton T-shirts. Adding performance apparel to your product line can also broaden your customer base. You’ll have a product you can sell to top tier schools, dance academies, and athletic organizations in your area. You may even apply these principles to selling custom haute couture ladies fashion. To help you approach these markets, we’ll take a look at what defines performance apparel, and how to decorate it with dye sublimation and CAD thermal transfer film. Because of the characteristics of new heat transfer films on the market, some of us tend to think of performance apparel in terms of stretchability. But the basic property that defines performance apparel is its ability to keep athletes cool and dry. This feature, commonly referred to as “moisture wicking”, carries perspiration away from the wearer’s body and through the material where it can dry more rapidly. This reduces body temperature and enhances sustained vigorous exercise. Because we’re dealing with all kinds of physiques from lightweight to linebacker, many performance apparel products stretch to accommodate bulkier body styles. This is done by including spandex in the fabric. Products like Under Armor and Vapor Apparel are 5 – 7% spandex mixed with polyester microfiber or cotton. 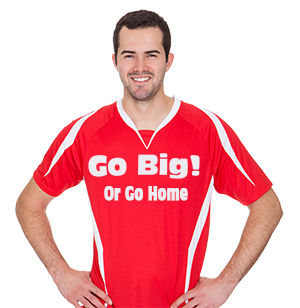 Champion Double Dry® shirts are 15% spandex, 85% polyester. What are the best methods for customizing these exotic garments? The two options we’ll discuss here are dye sublimation and heat transfer film. Because most of these garments are made primarily from polyester, they’re ideal for dye sublimation. 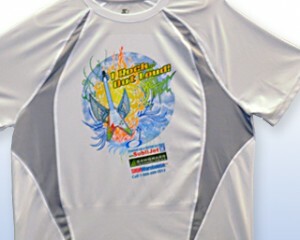 Sublimation has an added advantage for decorating performance apparel. Since these garments are designed to carry moisture through the fabric, sublimation is ideal because it doesn’t add a surface layer that can block the pores of the fabric and interfere with moisture wicking (Fig 1). So a Champion or Under Armor shirt that’s been sublimated will remain as cool and comfortable as the day it came from the factory. Since sublimation dyes the polyester molecules instead of depositing ink or film on top of the fabric, it also retains the softness and comfort of the garment. Of all the digital garment decoration technologies available, there’s nothing softer than sublimation. But be selective about what shirts you choose to decorate. Sawgrass Technologies Director of Consumer Education Jimmy Lamb cautions “All shirts are not created equally! Just because a shirt is polyester or poly-performance doesn’t mean it will sublimate well – in fact it may be a disaster! As the popularity of the product increases, some of the suppliers are billing their shirts as sublimation-friendly simply because of the poly aspect, when in reality they do not work well for dye sublimation. Many sublimators are familiar with the Vapor foam and settings for apparel sublimation. However, it should be noted that the Vapor process may not work on other brands of shirts”. Other brands of polyester garments may have extraneous surface treatments, low white point, or low thread count, all of which can seriously degrade print quality. Sublimators are advised to test a garment before committing to any specific brand of polyester apparel product. There is one other universal caveat involving dye sublimation. Since the dye transfers directly to the fabric, sublimation only images well on white or pastel garments. Sublimating a red shirt is a non-starter unless you only want to add black. So for customizing dark or mid-tone performance apparel, you’ll need to use a heat transfer film. Which ones work best? To decorate darker garments, you’ll need a heat applied CAD film aka “T-shirt vinyl” such as one of our EnduraTex or Siser products. SignWarehouse carries over 30 varieties of CAD cut and digitally printable T-shirt film, but not all are ideal for this application. For performance apparel, you may need something especially flexible. As Jimmy Lamb said, not all performance apparel is created equal. Not all garments in this segment include spandex. Starter Dri-Star® sportswear, for example, is 100% polyester and has moisture wicking components, but is not particularly stretchable. So a standard heat transfer film like HotMark 70 works fine for this product. A more complex fabric like Champion Double Dry® will require a higher performance film. Here are some suggestions for successfully stretchy garments. The other challenge in this segment is the advent of antimicrobial coatings that are designed to fight body odor. Some of these have been found to block adhesion by T-shirt vinyl and cause immediate or eventual failure. Make sure you do some adhesion testing before you complete a big job and deliver shirts to your customer. Sometimes the failure doesn’t occur until the garments are laundered, so wash-testing your shirts before delivery is a good idea. Click here for more details about this issue. Fig 1: For the most demanding performance apparel, Easy Weed Stretch is a good choice. 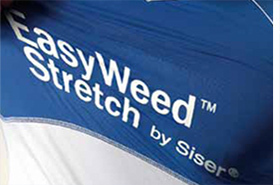 Siser Easy Weed Stretch: Easy Weed Stretch takes the hot peel convenience of Easy Weed and adapts it for Performance Apparel. At 3.4mil, it’s a little thinner than Easy Weed. It has a softer hand and a much more flexible face film made specifically for performance wear and Lycra® spandex. Stretch can also be applied to 100% cotton, 100% polyester, and cotton/poly blends and is available in eleven colors. The Performance apparel market isn’t the only good application for Easy Weed Stretch. Lots of garment decorators are finding that this film does very well on super-soft cotton shirts as well. So if you’re using Easy Weed, but you have a picky customer who wants something with a softer hand, you may try Easy Weed Stretch. Fig 2: Chemica QuickFlex is a very soft, hot peel film with good stretch & rebound. Chemica QuickFlex: QuickFlex is a soft, warm peel polyurethane film similar to Siser Easy Weed. QuickFlex is designed for high volume production so it can be pressed in only five seconds and peeled immediately. Like Easy Weed, it has a self-adhesive carrier with more tack than HotMark or other PU films. This makes it easy to place graphics precisely where you want them on the garment, but it’s not quite as tacky as Easy Weed so it’s actually a little easier to weed. It’s also very soft and has great stretch and rebound characteristics (Fig 2). It’s not quite as stretchable as Easy Weed Stretch, but does well on Lycra Spandex and blended performance apparel. EnduraTex Resolve Plus: EnduraTex Resolve Plus is a traditional super-soft PU heat transfer film designed to give customers that screen-printed look and feel. Its’ almost as soft as sublimation and comes in 50 colors. Resolve Plus isn’t as stretchy as Easy Weed Stretch or QuickFlex so it shouldn’t be your first choice for a very demanding performance apparel graphic. But if your customer needs something in an unusual color like Khaki and wants it on a blended garment with moderate stretchability, Resolve Plus will work (Fig 3). And it will feel terrific on the garment. Just remember to add a little more pressure when you apply it. 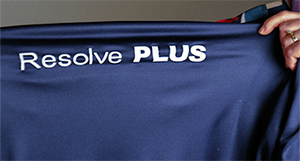 Resolve Plus has a pressure sensitive adhesive and works best with firm pressure. Peel at room temperature. Performance apparel is a growing market that can connect you with new customers including schools, dance academies, sports franchises, and more. It’s a great way to build profitability. Like any new market segment, it can also present unique challenges. Make sure you choose the right decoration method, choose the best garment for sublimation or the best film for CAD decoration. Try to avoid antimicrobial coatings if possible. And always, always, test before selling.